A few weeks ago in order to participate in the Summer Pinterest Challenge, we scraped together a few items we had laying around the basement to create a project for almost no cost and little effort. For our modest investment of a little time (most of it spent watching paint dry), we now have a hidden chalkboard message center on the back of two of our kitchen cabinet doors. As much as I love a "free" project, the fat sticks of sidewalk chalk we had purchased from Target several months ago, though great for hopscotch games, left something to be desired in the way of penmanship chalkmanship. Alex knows my penchant for neat handwriting, as well as my love of things that are not covered in chalk dust, so he made a noble attempt to remedy our dillemma and purchased "chalk pencils." In reality, he had purchased pastel chalk pencils, for chalk artists. 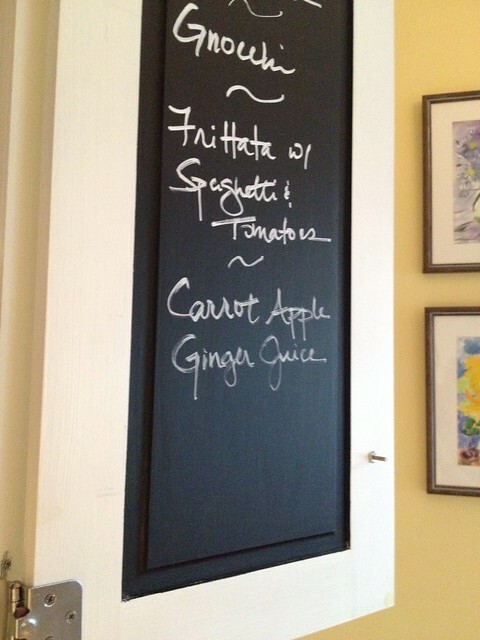 Though they write on the chalkboard paint we had applied to the backs of our cabinet doors, I wouldn't particularly say they do it well. Not to mention the sound that tends to accompany the thin tip as it jumps along marking the surface has a very Freddy Kreugerish, "finger blades on industrial pipe" melody. Trust me, far worse than fingernails on chalkboard, it makes Lulu hide her head. I also can't forget the difficulty of cleanup. Soapy warm water plus a bit of elbow grease seems to get the job almost done, but I fear we'll always have some ghosts of meal plans and reminders past. So after that failed experiment, and a waste of $11 unless Alex decides to pick up artistry and starts working in chalks (I don't see it happening), we're back to the chalk drawing board. We started looking around at the various options and kept seeing Chalk Ink, and similar chalkboard pen style writing implements. These are the same pens that coffee houses, sandwich shops, and places like Trader Joe's use to make their brightly colored chalk drawings. They go on more like ink or paint, with consistent lines, true edges, and bright colors. The other advantage is how well they write on glass and other non porous surfaces. We were hopeful we had a solution, but there was one significant caveat. Through our research we learned that these pens have been known to ruin chalkboard painted wood. Wood is a proud surface, and chalkboard paint over wood is still rather porous, so the ink likes to jump into those little pores and sit there forever. When this happens, you're left with a ghost image of what you had written. You're only option is to put another coat of paint on. Talk about an inefficient process. Knowing the risk, we went ahead and ordered one of these pens. Our feeling was simple. The wood our cabinets were made of is a good hard wood. Not to mention we had painted them white, which went over a layer of primer, and then finally we had our chalkboard paint. If ever there was a chance a porous surface might not be porous any longer, this was it. After shaking and then priming the pen with several pumps, I nervously wrote out a few items for the week, hoping we wouldn't be repainting later in the day. After allowing the ink to dry for a few minutes, Alex grabbed a paper towel and dampened it with warm water to make our attempt to just wipe it away. We had our fingers crossed. As you can see from the photo, the ink was gone, but wait, the paint still had an outline of the words that had been written. Oh no! Is this what people are talking about? Had we just ruined our project? Would we need to repaint? Well, I guess this isn't a real surprise, but we're a bit neurotic. This is one of those situations where patience is key (and we had exercised none). As we were lamenting another $8 wasted and the time necessary to repaint, the water we had used to wipe the board began to dry, and the outline began to fade away. Just about two minutes later and our chalkboard was back to a clean slate, just waiting for another recipe. Success! I'll be using this pen for sure, and I may even be tempted to pick up a few colors other than white, especially since I know the option works for our board. 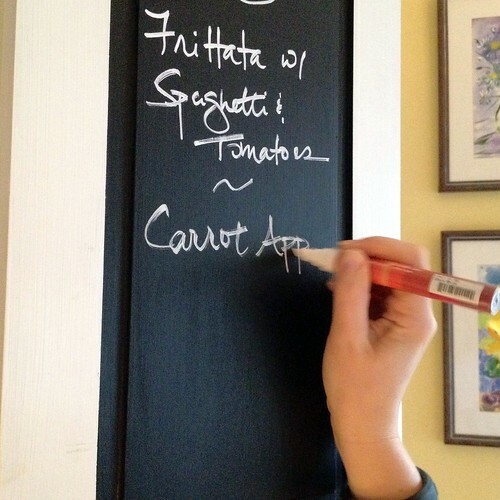 Who knows, with how great this stuff works, we may end up with more chalkboard covered surfaces in our house. Only time will tell. If you're interested in using this type of chalk ink, I think the key here is the hardness of the surface the paint was applied over. Even if you're putting the chalkboard paint over a porous surface, you should still be okay as long as you have many layers of paint and hard wood under the chalkboard paint. 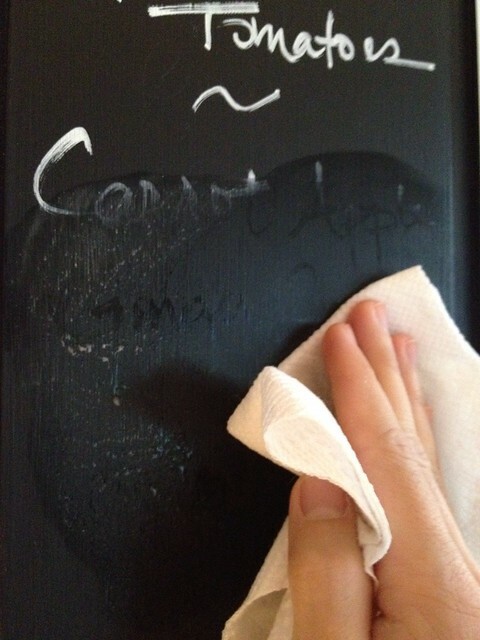 Another option that may work is to apply an oil based primer before the chalkboard paint. The oil based primer should make a porous surface more consistent. I know several other people chimed with knowledge of these pens in on our previous post, thanks for that! Your feedback helped us land on a winning choice. But does anyone else have any particular preference or experience? Has anyone inadvertently ruined their chalkboard by using this type of pen? I'm just curious to see the experiences of others in this matter. Harumph! Now that we've used this pen for a little while, we're sad to report that it has permanently stained our chalk board paint. The pen erased easily when you write and then erase within a few hours. But if you leave the writing on the paint for a few days, it leaves a ghost of the writing that simply can't be erased. Looks like we're going to be having Tuna Casserole for the next few years. Just wanted to let you all know what to look out for. 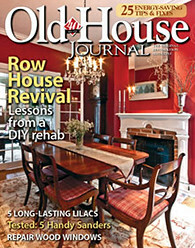 Ask Old Town Home: What Should We Do With This Fireplace? Thanks so much for posting this! We are about to paint a short wall in chalk paint and I wondered if there was any need to find a special writing utensil. Now I know! 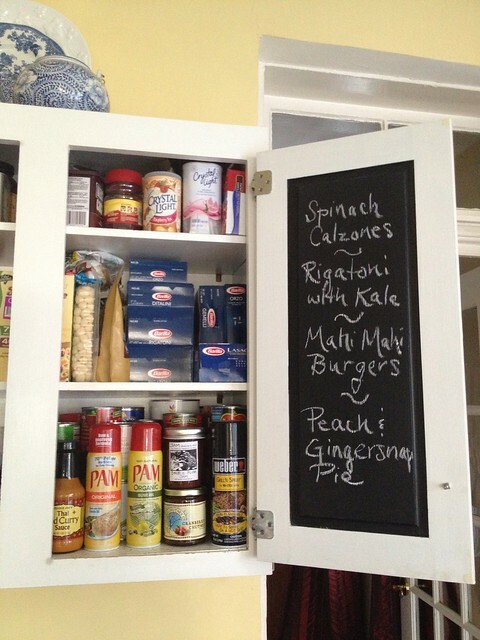 Love the idea of the board in your cupboard as well! Thanks Marcelena. We're happy to help! Good luck with your project. Wendy - where did you find this for only 8 dollars? 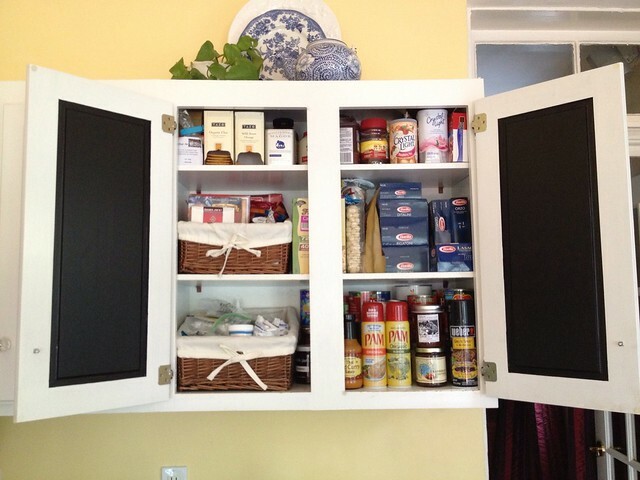 I recently did the jars in my pantry with chalk paint and haven't been happy with the regular chalk from michaels. However, I only found them online and shipping was twice the cost of the pen!!! I'm local to NOVA and would love to know where you found them. Thanks!!! 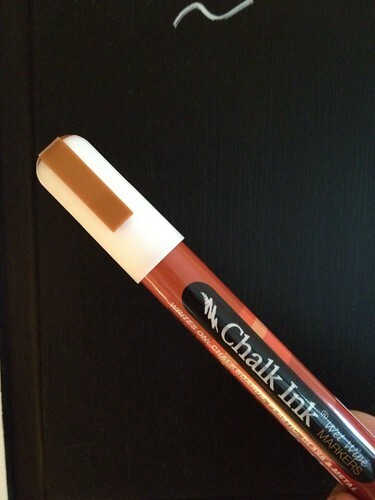 We actually purchased the chalk ink marker from Amazon. (The link to it is in the post if you scroll back up.) We have Amazon prime, so shipping was free. If I see them when I'm out and about, I'll let you know! Good to know. 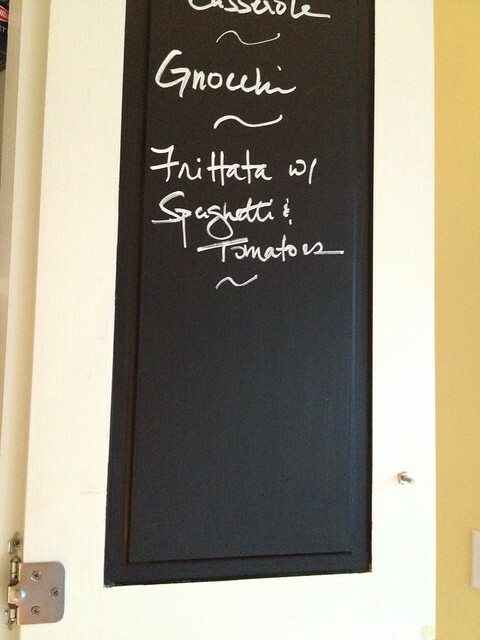 Not sure if a chalkboard paint is in our future, but it's nice knowing what you need to make it look good. Yeah, those pens are great. I used them to write menu boards at the College Bar in Oxford. One caveat, some of the colors don't look as great as you may hope when you use them on dark surfaces (and it takes some experimentation to find the right ones, especially if you are trying something more artistic). Thanks for the inside scoop, Thad! So far we've only experimented with white, but it's good to know some colors might not work as well. 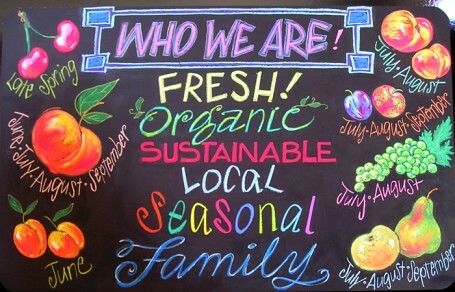 I'd love to be able to create something like the fruit and veggie sign pictured, but my art skills have a long way to go! Did you read this carefully.......in the long run, they ruined her chalkboard. Super cute idea. Love it! Thanks so much, this was extremely helpful. I was thinking of inexpensive Christmas presents (a mug w/ a chalkboard painted on part of it) so this was good to know. Have you found any alternative since for your chalkboard? It seems the porous and scratchy nature of the blackboard paint finish which is designed for old fashioned chalk will be troublesome when one uses the chalk ink since it is so liquid and will be absorbed by the blackboard finish. I am thinking about only using the chalk ink pens and am planning to apply a finish of matte finish clear polyurethane over the blackboard paint so it will be easier to clean up. What do you think? 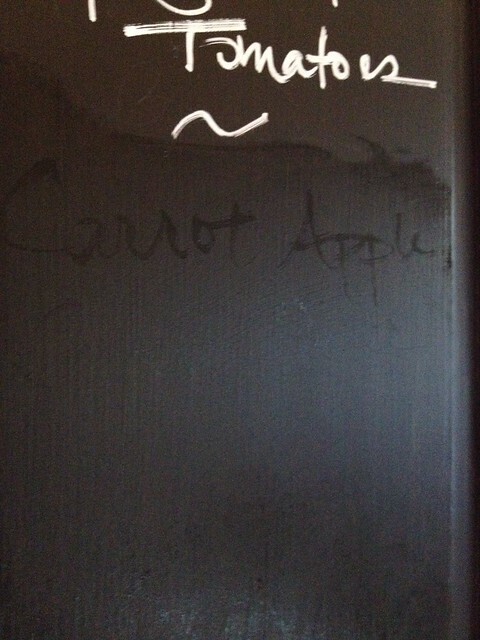 Wondering if either of you tried the matte finish poly coat to help with the porous nature of the chalkboard paint. Did it allow you to use the chalk pens and wipe away easily? Thanks! I just saw on chalkink's website video to take off the chalk marks with windex. maybe this will help. Thank you for giving an update on how it went. At least, I get to know options on what to use for when I do something like this in the future.